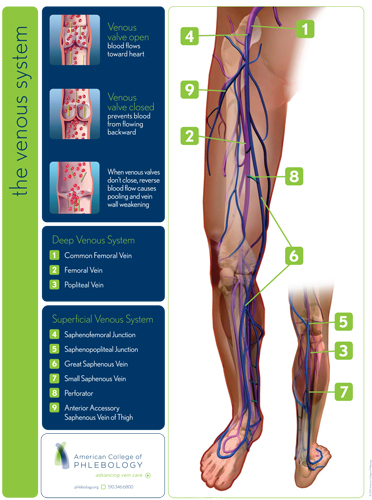 There are many reasons to undergo treatment for venous insufficiency. During your consultation for varicose vein problems, Dr. Karamanoukian will evaluate your legs with visual inspection, vein mapping with Vein Lite which transilluminates the veins AND use the Vein Viewer which uses infrared technology to visualize the veins - as such, Dr. Karamanoukian will map the varicose veins, reticular veins, feeder veins and spider veins in the legs. Next. Duplex scanning is peformed to determine whether there is venous insufficiency at the saphenofemoral and saphenopopliteal junctions, aslo known as truncal venous insufficiency. This determines whether you are a candidate for endovenous laser (VenaCure EVLT), Radiofrequency ablation with the Venefit Procedure (previously called VNUS Closure), or the ClariVein Procedure (mechanochemical ablation). At the Vein Treatment Center, Dr. Karamanoukian also utilizes the newest and most advanced laser system to perform endovenous ablation procedures ! This happens to be the VenaCure endovenous laser therapy (EVLT) Never Touch system. Dr. Karamanoukian has been using the VenaCure EVLT Never Touch system since 2007 and to date has performed over 18,000 endovenous ablation procedures - combined Venefit Procedure (previously called VNUS CLosure, EVLT and EVLT Never Touch Procedures). We incorporated the VenaCure Never Touch procedure in our armamentarium of procedures since 2009 to treat venous insufficiency involving the great saphenous (GSV) and small saphenous (SSV) veins. Although other surgeons were quick to adopt this second generation FAST catheter, Dr. Karamanoukian waited for the clinical results to be published in the scientific literature before adopting it and using it in his patients. Having published over 140 scientific articles, Dr. Karamanoukian believes that adopting new technology should await hard proven scientific data. However, Dr. karamanoukian is the first surgeon in the world to perform bilateral VNUS Closure procedures (Venefit Procedure) at the same office setting! This is very helpful in reducing the number of trips and allowing the patient to resume all activities as soon as possible, typically returning to work the same afternoon and certainly by next morning ! This work was started in 2006 and presented with 2 year follow-up at the 2009 American College of Phlebology Meeting in Palm Desert, California. Minimally-invasive procedure for varicose veins: Avoids prolonged surgery or extended downtime. Quick recovery when compared to traditional vein stripping procedures. Less pain and discomfort when compared with vein stripping procedures. Covidien on December 20th, 2012 reported durability of the Venefit Procedure (previously called VNUS Closure) in a 5-year outcome study. The ClosureFast Study was conducted at eight centers in Europe from April 2006 to June 2007. The Venefit procedure, using the ClosureFast radio frequency ablation catheter, was used to treat 295 lower limbs in 225 patients diagnosed with superficial venous reflux, the underlying cause of varicose veins and [chronic venous insufficiecy].